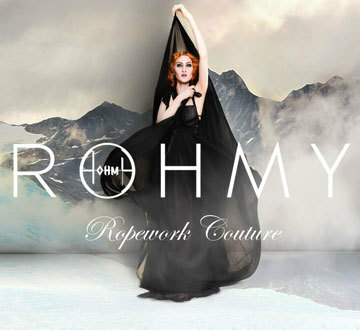 ROPEWORK COUTURE best describes the signature style of the German label ROHMY. Inspired by classical sculptures the timeless contours in ROHMY Gold Label are graceful, elegant and flow with finesse. In ROHMY Black Label the draped asymmetrical and abstract silhouettes create a contemporary, edgy look. Woven wih craftmanship, each piece becomes a tribute to artistic intimacy. Ropework Couture best describes the signature style of the German label ROHMY. Inspired by classical sculptures the timeless contours in ROHMY Gold Label are graceful, elegant and flow with finesse. In ROHMY Black Label the draped asymmetrical and abstract silhouettes create a contemporary, edgy look. Woven wih craftmanship, each piece becomes a tribute to artistic intimacy. Behind independent designer ROHMY is a Karlsruhe- born talent who grew up with her sister and musician parents in a fabulously artistic environment. Having brought up amongst art and music, her passion and knowlegde for crafts paved the way to her design aesthetics today. She started to bring her talents towards a professional direction by graduating from a school for textile technology what she passed with distinction. Afterwards she learned skills and knowledge of crafts by completing her training in tailoring. After her graduation as a bespoke tailor she began to study Fashion Design and eventually started her own Fashion Label ROHMY after her final degree.